One of the eight Advancing Excellence goals is to reduce pressure ulcers in nursing homes. The following quality improvement monitoring tools provide valuable information on preventing, treating, and tracking ongoing and newly acquired pressure ulcers. 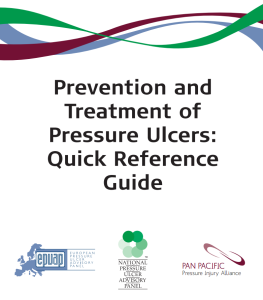 This Quick Reference Guide presents a summary of the recommendations and excerpts of the supporting evidence for pressure ulcer prevention and treatment. The more comprehensive Clinical Practice Guideline version of the guideline provides a detailed analysis and discussion of available research, critical evaluations of the assumptions and knowledge of the field, and description of the methodology used to develop guideline. This Quick Reference Guide is intended for busy health professionals who require a quick reference in caring for individuals in the clinical setting. Users should not rely on excerpts from the Quick Reference Guide alone.